Photo: Got to start somewhere. Want to try your hand at Thai cuisine? 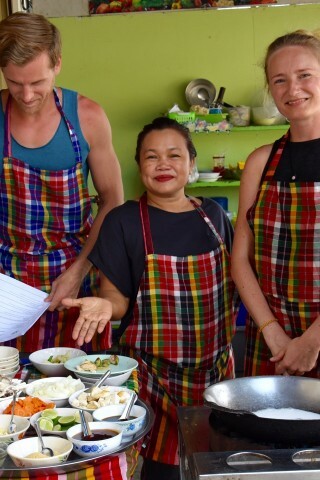 Kanchanaburi has a few cooking schools including two owned by teachers who have been at it for years. Browse places to stay in Kanchanaburi on Booking.com. Book Now - Pay Only When You Stay. A native of Kanchanaburi, Chef Noi is a dynamo who speaks clear English and taught us several interesting facts about Thai dishes—and we were just stopping by for lunch. After a trip to a local fresh market, students settle into a spacious and immaculate air-con kitchen to prepare several dishes, including a curry and a traditional Thai dessert. You’ll then enjoy what you’ve cooked at Blue Rice Restaurant’s relaxing riverside terrace. Costing 1,950 baht per person, classes with up to four students typically run from 09:30 to 14:30 on Mondays and Wednesdays, but may be available on other days when requested. Located slap bang at the centre of the traveller strip, On’s Thai-Issan does one-hour cooking classes on request for 600 baht per person. Hailing from Si Saket province, On reminds us of so many friendly cooks from Issan, but she’s a savvy entrepreneur who learned English and carved out a successful niche in Kanchanaburi. The fairly casual classes take place at a couple of woks on a small streetside stoop. Students select three main dishes, all vegetarian, from a menu including salads, soups, curries, noodles, stir-fries and desserts. Afterwards you’ll sit and eat in On’s air-con restaurant. One of several activities offered by Good Times Resort and Travel Service, experienced Thai chefs teach group classes with two to eight students in a large restaurant kitchen. You’ll start with a trip to a fresh market before selecting four out of 14 standard Thai dishes, such as tom yum, pad Thai and chicken cashew nut, to prepare largely from scratch. Unlike the more intimate classes at On’s and Apple & Noi, Good Times’ classes are led by employees of a large company. Still, the 950-baht price tag is enticing for classes lasting from 09:30 to 01:30. Shorter afternoon classes may also be available.